In Spring 2019, Lantiseptic's manufacturing process has been improved and the packaging has changed. This has changed the product. Read details below. 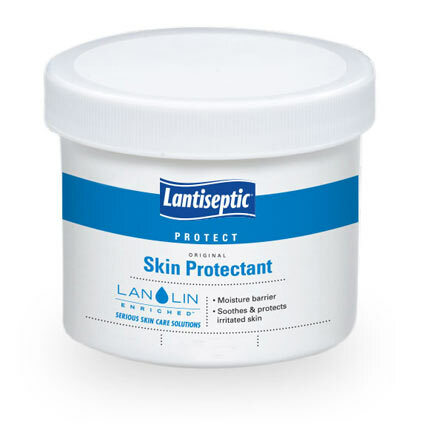 Lantiseptic Skin Protectant is an emollient ointment intended to protect chafed or ulcer-prone skin, promote the healing of skin injuries and serve as a first aid treatment. It is formulated to encourage the proper moisture balance of the skin, thereby supporting the body's natural healing processes. Diaper Dermititis  With age, the epidermal layer of the skin, composed primarily of keratinocytes and stratum corneum, becomes dry and fragile with decreasing turgor and elasticity, predisposing the skin to irritation and breakdown. Research has shown that barrier ointments containing lanolin and petrolatum - the active ingredients in Lantiseptic - are more effective and longer-lasting in maintaining hydration and skin integrity among residents in skilled nursing homes. Ulcer-prone Skin - Excellent results with Lantiseptic in the care of pressure sores stages I and II have led to its introduction for general use in nursing homes. The manner of use must be adapted to the needs of the individual patient and must be in accordance with the procedures of the nursing home. The moisturizing, emollient nature of the ointment maintains a superior environment for the healing process. Incontinence - Lantiseptic is an effective skin protectant where urine, feces or intestinal contents irritate the skin. It should be applied to clean dry skin in sufficient quantities to act as a barrier. Its emollient action will help protect the skin and speed healing. DermaRite Industries acquired the Lantiseptic brand in late 2018 and determined that improvements could be made to the active ingredient - Lanolin. The form of Lanolin previously used was a decolorized/bleached type of lanolin that, while not a problem for most users, can contain resides from this bleaching process. DermaRite opted for a more natural 'full-spectrum' lanolin which captures the natural goodness of Lanolin without removing its naturally-occurring benefits, or adding any residues/contaminates from the bleaching process which can affect impaired skin for some patients. As a result, the Lanolin now used in Lantiseptic has a natural color. The product you receive as manufactured has undergone quality control testing and meets the same product criteria as before, and will continue to perform as expected. Overall, the changes to the manufacturing process have made Lantiseptic a more natural skin protectant. Below is a comparison of the Inactive Ingredients from the original and new labels. I have been using this product for many years for my adult daughter who is incontinent. This is the only product that I depend on for keeping her skin intact. it has worked for years when applied after each change. We have never had skin issues with this routine. I am thankful!! Use as skin protectant on bottom of bedridden father. Best product for dry skin that I have found and have looked for years. I have used this product for many years for my daughter who is incontinent. With cinsistent use she has never had any skin breakdown or infection. I rely on this product . have used this product for years as incontinent protectant for my disabled daughter and have found it to be the most effective product when used after each diaper change. Her skin is perfect even at 37 years of age. Excellent product, quick healing for my baby's bottom. I use this product often, immediately when I have any type of skin irritation. I have encouraged others to use it, a small amount goes a long way. Anywhere skin meets skin this ointment will help. Will continue to buy this item! Consistent use of Lantiseptic helped preserve my seat from pressure sores during a trans-continental bicycle ride (26 days, 2800 miles). It acted not only as a lubricant, but as an antiseptic. I will be using it again shortly on another trans-con (31 days, 3500 miles). I purchased this product as my mom is 90 yrs. old, paralyzed, incontinent & in a care facility. This facility used to use the Lantiseptic apx. 1 yr. ago then stopped I guess to keep costs down. Since then my mom has gotten many UTI's & a sore on her "tush". This is an EXCELLENT product & does what it claims to do. Good product for in continence on delicate skin. Leaves spots on clothes but comes out with powder pretreat. Protects well if pads are changed three times a day. Best price I have found when taking advantage of free shipping over $50. My nurse turned me onto this product 20+ years ago and I have tried many others but this works the best I have found. The Best Product of its Kind!! This ointment is great for diaper protection, and also helps to prevent bed sores! It's the best thing I've found. My 97-year old mother suffers dementia and incontinence. While we have used many products to protect her skin, nothing has enabled the complete healing and continued protection afforded by this product. STL Medical offers the best price of the many sources available. Love this skin ointment !It works great! my mom is bedridden with a feeding tube that some times leaks food onto the skin. This product protects that area and keeps the skin free from irritation. Also great for protecting the skin from incontinence issues. I have used this product for over two years. My spouse has been bedridden after a stroke left her partially paralyzed in 2009. While in the hospital and nursing homes for rehab she has resisted rolling to either side, preferring to lay on her back. Not only does she not have any sign of bedsores, but her skin looks remarkable. After a short stint in a nursing home 1n 2011 she came home again into home care with the skin on her backside looking blistered and after a month or so of this product her skin cleared and has stayed soft and supple with no signs of any distress on the skin. I would recommend this product to anyone who has any concerns about skin breakdown. I will continue to use this product as long as my wife needs it. Heal quickly. Keeps skin protected. I use this product for my mother. It keeps her skin from breaking down. I can not find any problems with this product. I was given a sample of this product when my Mother was in a facility. She eventually had some bed sores and the nurses and doctors suggested using many other products to protect the skin from feces and urine so it could heal. None of the other products worked. I finally pulled out the sample and used it twice. I could actually see a huge difference in the integrity of her skin. This product was integral in the healing of her bed sore. A month or so later, she had another bed sore and I immediately treated it with this product and the bed sore was gone very quickly. I cannot say enough good things about this product. It has saved me time and grief with skin issues that my Mother is experiencing due to her situation. I bought six 14 ounce tubs and now the caregivers are believers in this product as well. 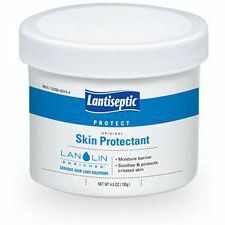 I started using Lantiseptic Skin Protectant after receiving a sample packett at a facility that my Mother was in. Recently, she had a diaper rash, heat rash and a bed sore. After trying the creams and ointments suggested by medical professionals and getting no relief, I tried the Lantiseptic and was amazed at the rapid healing I witnessed on all her skin conditions. I am sold and will order more soon. It isn't overly priced and does not have a bad smell, so for my Mother, it has been a life saver. Great product!! Bed sores and rashes are all gone!! This stuff used to be called "Corona, Original Formula", but it is no longer sold as Corona. It's now sold as Lantiseptic Skin Protectorant. Same stuff, same great action! This was requested by the home health caregiver who cares for my elderly aunt and uncle, as being the best product for healing and preventing the rashes and sores that come with being bedridden and wearing adult diapers. [...] Fair price. All is good. Product is used as directed. My mother is a blind invalid, 24 hr care and has not been out of a hospital bed for at least 2 yrs. I have had several Drs compliment me on her skin care and can not believe that she does not have bed sores. She has had RA since she was 20. My being disabled also I am not able to turn or shift her every 2 hrs. The Drs said whatever I'm doing keep it up. 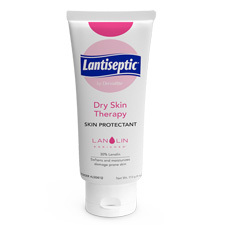 I don't think there is anything bad to be said about Lantaseptic cream. Mom had small bedsore on hip for months, nothing would heal it. Lanaseptic healed the bedsore and it is still well after 3 months. I wouldn't use any thing else on her skin. We are thankful for this product. Our daughter is severely handicapped and must wear adult diapers. She had severe problems with skin breakdown. We had tried several other products with limited success. Her temporary nurse told us about this product, and it has cleared the problem. The drying affect is great.